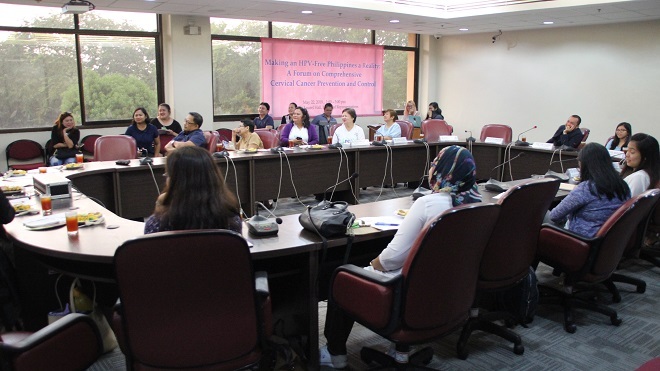 In observance of the National Cervical Cancer Prevention Awareness Month and the International Day of Action for Women’s Health, the Philippine Legislators’ Committee on Population and Development (PLCPD), in partnership with the office of Akbayan Party-list representative Tom Villarin, organized a forum on cervical cancer on May 22 at the House of Representatives. Opening the forum, Mr. Kyle Salcedo, representative of Congressman Tom Villarin highlighted that the prevention of cervical cancer and other reproductive tract cancers is among the elements of reproductive health. Mandaluyong Representative Queenie Gonzales shared her cervical cancer prevention program in her city and why legislators have a critical role in the prevention of cervical cancer. Dr. Laila Celino, of Department of Health – NCR shared government efforts on cervical cancer prevention.